Discussion in 'vBench (Works in Progress)' started by MarquisMini, Sep 8, 2008. 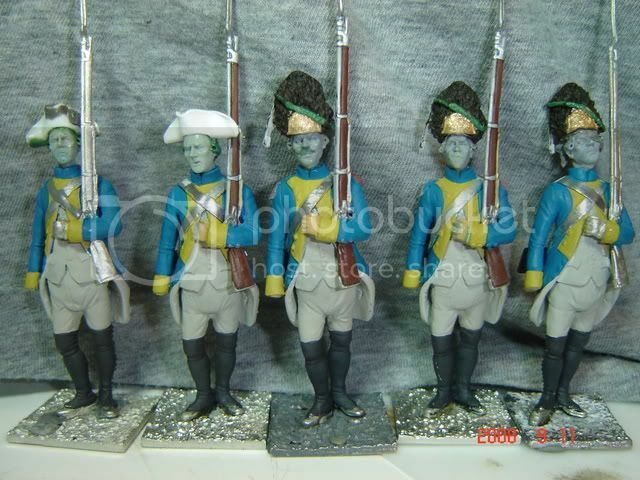 The Yorktown diorama continues with the addition of these front line soldiers from the Royal Deux-Ponts Regiment. 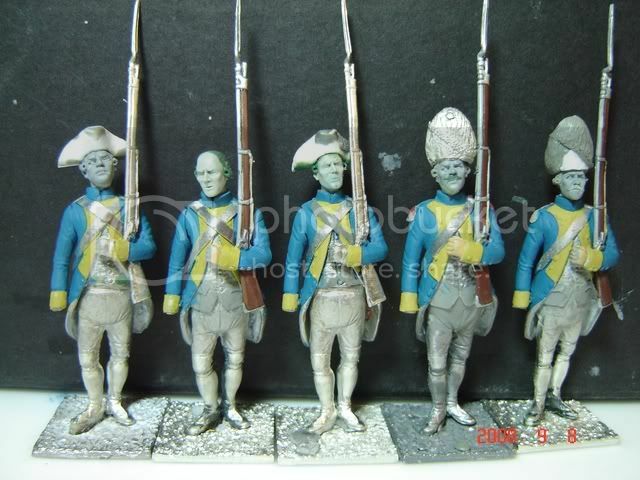 Figures are again conversions from a Modeles and Allures Régiment de Navarre (1767) kit using Magic Sculpt and Green Stuff. Heads are from JMD. Comments appreciated and welcomed! I'm looking forward to the finish of the diorama. Gotta agree with Marc there Daniel, this is going to be a impressive dio. Marc,Roger,as always thanks for your comments. 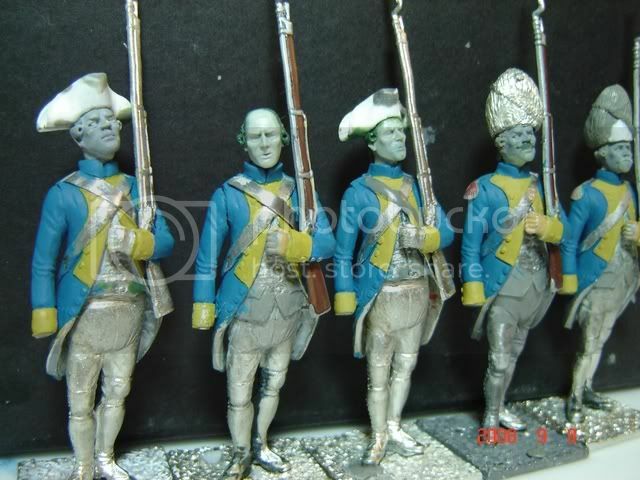 It's quite a project,i spent already a year in wich i learned more and more.I had this regiment almost complete,but decided to re-paint few of them trying new techniques and different mixes of colors. The figure look great already, looking forward to see them painted! Alot of work to do. Keep this going, it is gone be awesome. Can anyone tell me how to maken tricorne hats. 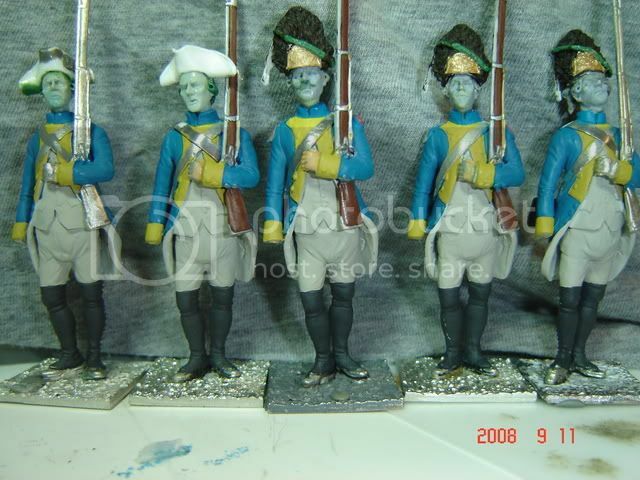 I find it rather difficult to maken them myself and these figures seems to have self made hats. Hello Dutch.Well...., making tricorne hats is difficult, believe me. I have tried several times in all sizes and shapes and find that the easiest way is to have some sort of basic shape and build over it with Procreate or Magic S.
To me, the greatest solution was finding the Historex pieces and parts, they have a great range including the Fleur-de-lys and grenades for the turnbacks. Contact me via Private message if you have more questions. Thanks for your reply.Now I know I'm not the only one having difficulties making hats. I did try the Stan Catchpool way ( you know, from the old Mil Mod), but thas wasn't a succes either.